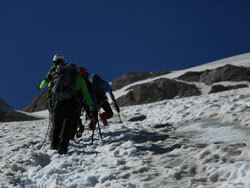 In the footsteps of Grohmann, the first to conquer the summit with the Dimai guides on 28 September 1864. Today the ascent is quite different: starting from the rifugio you reach the beginning of the glacier and then cross it through crevices and rocks. The experience is thrilling, thanks both to the magnificent summits that you can observe during the ascent and to the glacial environment that can still be appreciated today. When you reach the peak you are presented with a beautiful balcony with a view that stretches out to the sea and beneath your feet you can feel the abyss of the south wall: A 900 m cliff that only the best mountaineers in the world manage to climb. 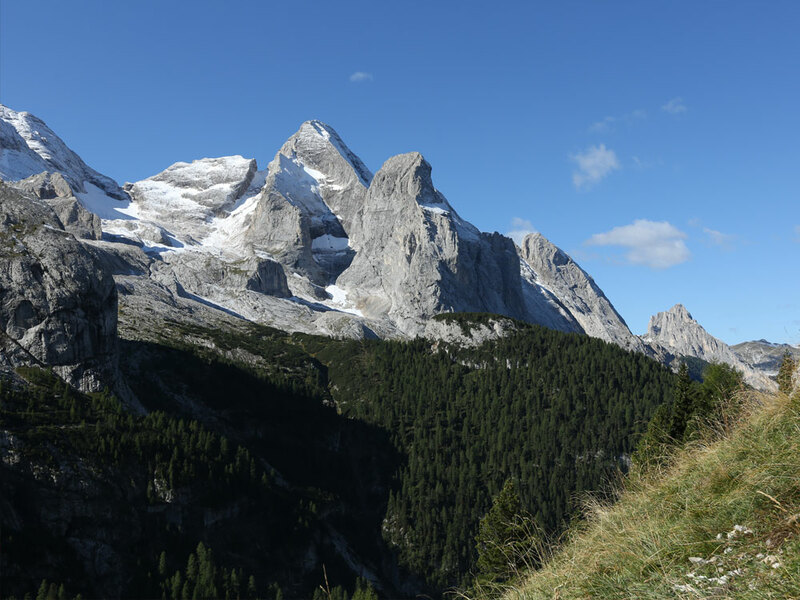 As an alternative to the trail through the glacier there is the ferrata of the western ridge, which goes to the Marmolada mountain pass before ascending up to the summit. The circular route is certainly the most popular. From the lush larches and Swiss pines of the pass, you arrive at the Ciamorcià area with its mountain pines and alpine meadows, and as you go up these give way to pioneer vegetation, scree and periglacial rocks. You will then find the Giant’s Kettles, dug out by the melt water of the glacier, and a suggestive canyon, all that remains of an ancient volcanic vein that cut into the limestone. Having arrived at Viel dal Pan, the next day you continue along the banks of the charming lake and then you go down through the green alpine meadows surrounded by the morning whistles of the Val Pettorina marmots. 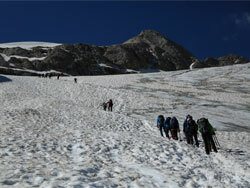 Following the course of the stream you can cross the glacial gorge of Serrai di Sottoguda to get to the Alleghe lake. The more adventurous can climb to the top of Punta Penia, go down along the ferrata to the mountain pass and then continue on to the Contrin Rifugio or Ombretta Rifugio. 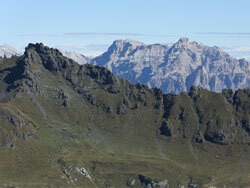 Shorter than the previous one is the direct crossing of the Marmolada mountain pass. 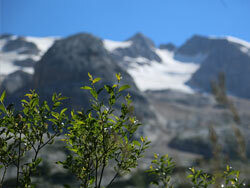 Are you interested in these trails but need a guide? No problem, the Passo Fedaia rifugi, in agreement with the Alpine Guides of the Val di Fassa, offer the possibility of crossing the Marmolada mountain pass to Val Contrin at a reduced price (80 €/P) but in complete safety! For an easier but equally evocative hike you can “circumnavigate” the great Marmolada along alternative routes: The “Northwest Passage” descends the Via Neva, goes along the historic Via dei Portatori up to Pian Trevisan, then to Penia and back up along the Val Contrin. The “Northeast Passage”: following the banks of the lake, you go down through the green alpine meadows before taking the Val de Franzedas, from which you can admire the imposing Marmolada in its entirety from the bottom of the south face. A beautiful and scenic ferrata, which follows the line of the trenches of the First World War, with a magnificent view of the entire Marmolada group, the Gran Vernel and the glacier. Start from Rifugio and take route 698 towards Porta Vescovo, then climb up the Mesola, an outcrop of smooth volcanic rock where the ferrata of the trenches begins. mountain path which was already mapped out between the mid-19th and early 20th centuries to make this lovely corner of the world more accessible to visitors. Departing from (or arriving at) the rifugio, you will have a great view on the Marmolada and Sella group of the Dolomites. 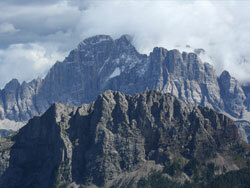 as the name says, is one of the longest ferratas in the Dolomites, stretching along the ridge as far as Punta Serauta. 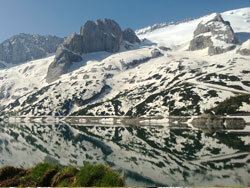 The scenery is spectacular, ranging from the majestic Civetta face to the Marmolada glacier. 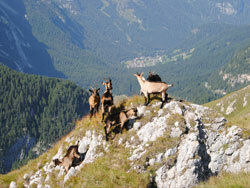 Not only for mountaineers and expert hikers! The walk along the Fedaia Lake is definitely an unforgettable quiet and scenic path.